On this last day of 2015 and you look back on the year, what was your favorite part of it? Was it a vacation or trip? A new person (or pet) in your life? A chance at a new career path? Did you run your first half marathon? Spent more time outdoors in nature? As I update my 2016 calendar for the new year ~ Question: what was my favorite experience of 2015? Answer: in May… a 5-night trip to Las Vegas. We did it up VERY well!!! Flight to Dallas, TX for the Seahawks/Cowboys game and to meet up with my brother/family. AT&T Stadium is amazing. Pecan Lodge. Iron Cactus. Tailgating and attending Seattle Seahawks games. Go Hawks! And being thankful for other places and people not mentioned here. My #OptOutside event of 2015 was to visit one of my favorite destinations ~ Snoqualmie Falls and Salish Lodge and Spa. 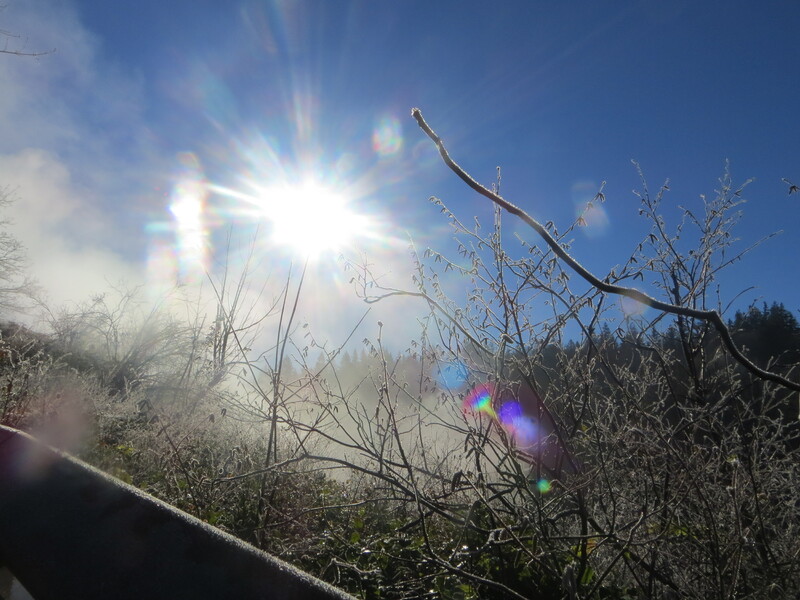 On this morning, ice was present and frost clung to the leaves and branches. The fog with the sun peaking through, made for an especially invigorating experience. We viewed the falls from above and hiked to see them below. The few hours consisted of 1) special trip to the Country Store within the Salish Lodge, where a long sleeve Tee was purchased along with a Christmas ornament for the tree 2) photos taken of the roaring waterfall named Snoqualmie Falls. The voices of international visitors could be heard during this traditional Thanksgiving weekend visit 3) a hike down the trail that is near to the bottom of the falls. In the past, we were able to climb the rocks near the falls but now there are barriers to help prevent this. I was lucky enough to get some of my wedding engagement pictures taken here prior to. Also, it has been fun to bring out of town guests here at different times. So, it continues to be a favorite place. To walk among the trees is magical…touch the moss and the hear the crispy earth beneath my feet. I especially liked seeing the engravings in the pavement of the newly built lower parking lot which has restrooms and a resting area. The engravings showcase a word in English and then beside it, in the Snoqualmie language ~ ‘Waterfall’ and ‘s.tkʷab’. The Snoqualmie People spoke the Southern dialect (txʷəlšucid) of the Lushootseed language used by many regional tribes who often spoke both the Southern and Northern dialects because of extensive travel in the Unites States and Canada. This language is now on the ‘endangered’ list with few remaining fluent speakers. The Snoqualmie people are southern Coast Salish Indigenous peoples of the Pacific Northwest Coast. A visit was made a year ago at this time as well, which included the delicious Salish Lodge Country Breakfast in The Dining Room at the Salish Lodge & Spa. The Snoqualmie Falls Store has a nice selection of Pacific Northwest gift options. And yes, I have stayed at the Lodge and enjoyed the Spa too. 🙂 See March 2011 post. Here’s to one of the Pacific Northwest’s (and my) “Best Places”! Ocean Shores, WA is 2-1/2 hours from the Seattle area. A great time to head to the coast is the month of September, May or any month in between. Walk the beach, find some shells, see wildlife and write a message in the sand. What else is there to do? A nice selection of merchandise can be found at The Village Shoppe and Flying Cats Gift Shoppe. Stop in at Elk Head Taproom (brewery located in Buckley) for a brew. Take a drive to Seabrook and have lunch at Mill 109 ~ the Whistle Punk Chicken Burger and a pint of craft brew hit the spot. ‘Our Place’ is known for their breakfast. The Ocean Beach Roasters has a nice selection of coffee, pastries, quiche, and more. Emily’s at Quinault Resort and Casino is good for a fine dining option. And while you’re at the Casino, take a spin at a slot machine to try your luck. Maria’s at The Polynesian is ok too. What’s up with the Sasquatch theme (or sightings) around the area? Ocean Shores is a gathering place for Sasquatch researchers from around the world gather to present their findings of the elusive bigfoot species. Witnesses share their experiences and information about Sasquatch. So, stay two nights to wind down and enjoy this Pacific Northwest beach and weather. You might also consider continuing your trip north to Quinault Lodge, Kalaloch Lodge and the beautiful beaches of the Washington coast. Fly a kite, paddle a boat, become a birdwatcher, or beach comb for treasures.